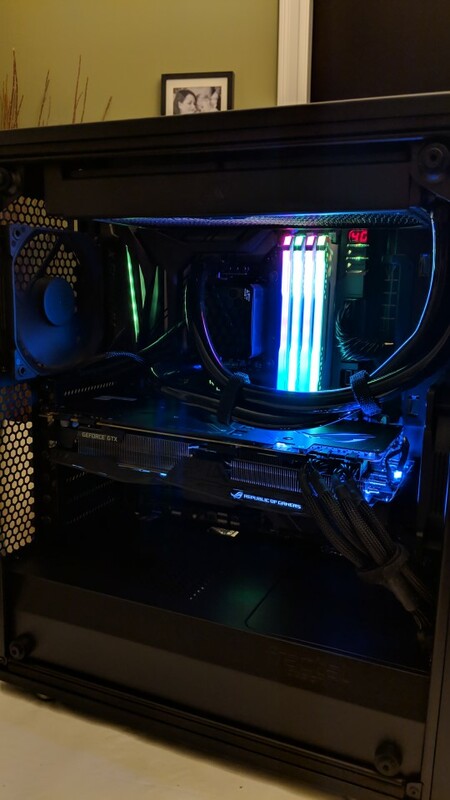 I completed the new build this weekend... Did not go as planned and I haven't even made it to the custom loop part yet! 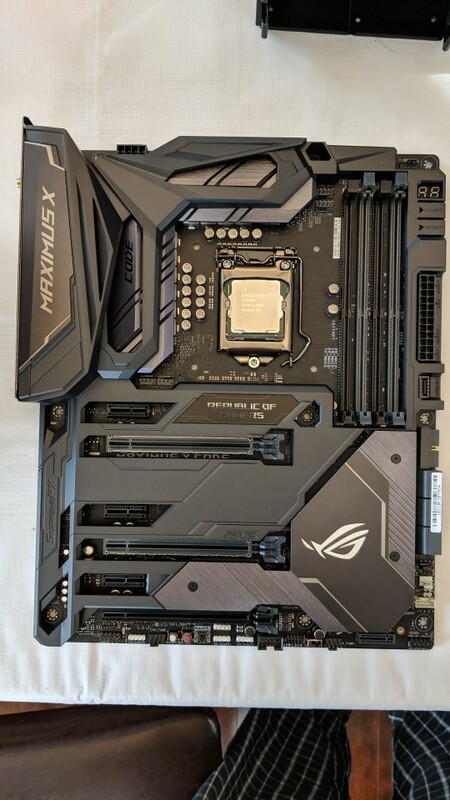 Going to use this thread to document the process of upgrading from my 4790K parts with the cooling I was using, through to the custom loop build in the end... I hope. - 240 rad in the top is as big as will work with the Maximus X Code. - Front rad will have to be slim, fan slim, whatever else I can find slim slim slim! Last edited by Lysrin; January 21, 2019 at 08:21 AM. Looking forward to seeing your WC build log. Not sure if it's been mentioned during your discussions on building loops in small cases.... one of the biggest things I've run into is the absolute necessity to ensure that you're not applying undue pressure on swivel barbs when you're trying to get the tube onto them. Sometimes in tight spaces it's hard to get the tube onto the barb, and the easiest way to get it on is to muscle it on without thought of how much pressure you're putting onto the joint. If possible, use straight barbs in tight spaces, or be very careful about putting extra pressure on the joint. Thanks for that sswilson. I'm certainly open to all suggestions and feedback! As usual, the folks on here have been great already getting me situated to start a WC build, so I'm looking forward to moving to the custom loop over the next little while. I agree about the small(er) case. I don't know if it was wise for my first custom loop build, but the Meshify C had the footprint I wanted. Alright, going to try and get some pics and info up here. Have been having trouble with HWC hosting so giving an alternate a try. If you guys think these images are too large or small let me know. Don't want this thread to be an irritation to look at! And these are just pics from Pixel 2. 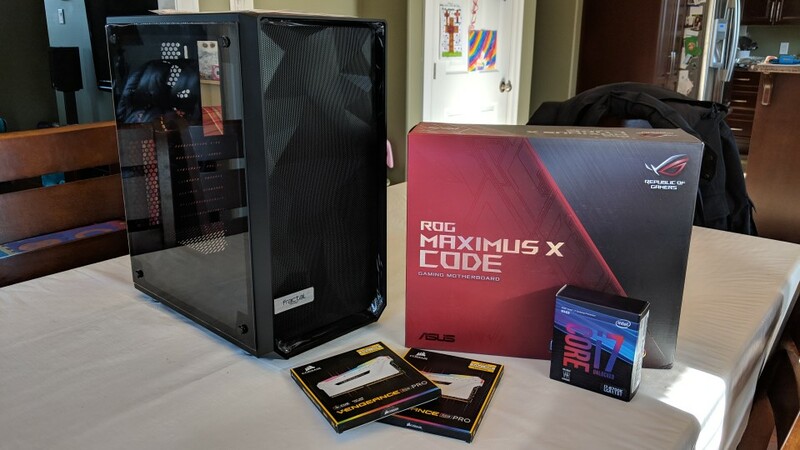 Special thanks to crazyea for "sponsoring" this build and selling me his 8700K parts! Size comparison to the old 650D. It isn't that the 650D is a bad case. 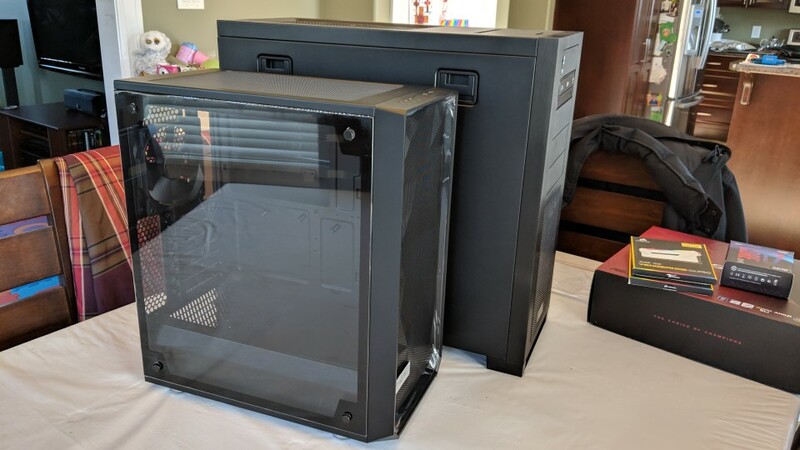 Just wanted to get something with a better glass side and ideally small enough to put comfortably up on the desk rather than hidden down on the floor. I figured if I make it to a nice custom loop build I ought to be able to see it and maybe show it off! The AIO I was running reached the 3 year mark at Christmas. So, as recommended by Swiftech, I decided to clean up. Thanks to rjbarker and JD for lots of advice in my other thread. This was my first cleaning effort for any kind of water cooling. 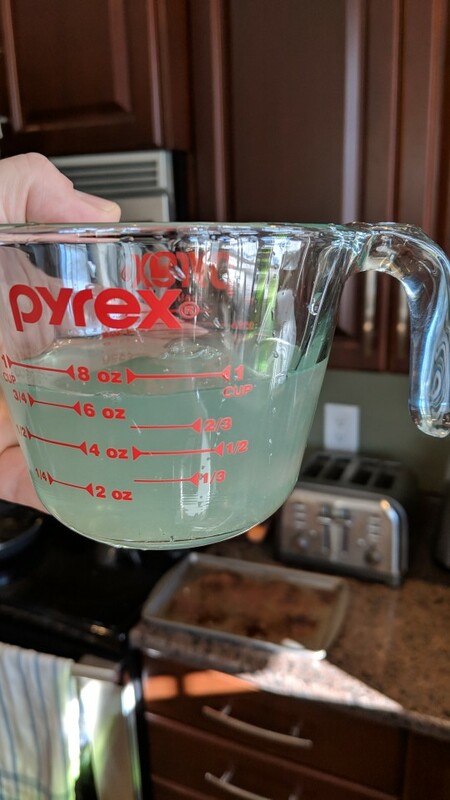 Here is what came out of the AIO. Did have a bit of a swampy smell and some small stuff floating in it. The cleaning solution, recommended by Swiftech was Pine-Sol and distilled water. Directions here: https://www.swiftech.com/FAQs.aspx The Pine-Sol smelled a lot better than what I dumped out of the AIO! Here it is running the cleaning solution for a few hours. 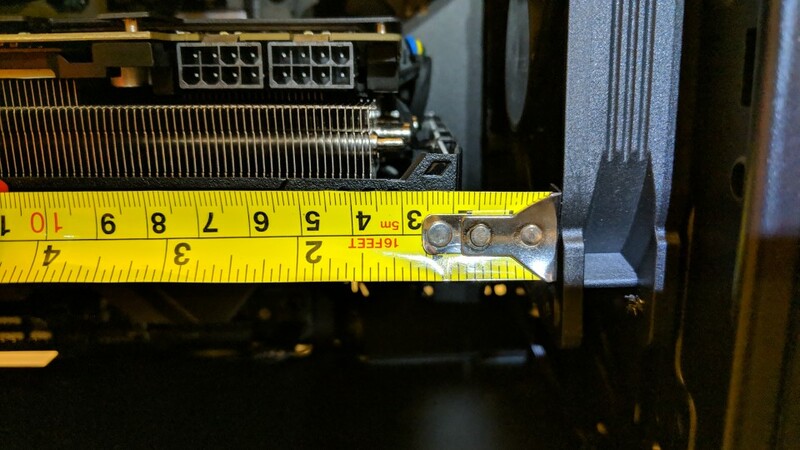 EVGA graciously included the connector to jump the power supply pins so that was convenient. 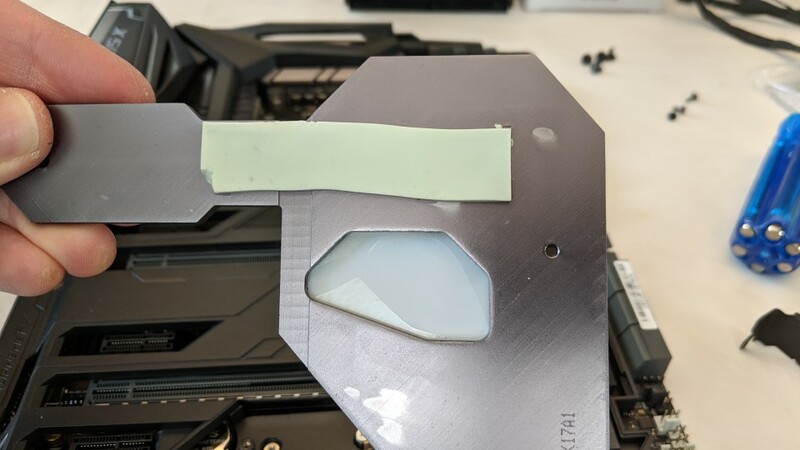 Thermal pad on the back of the M.2 slot heatsink. Something I wasn't sure about was putting the thermal pad onto the HP info label on the M.2 drive. Removing the label I think impacts the warranty, so I left it. Temps don't seem negatively impacted. Board, CPU, and RAM united! Mmmm... pretty RAM I know, matter of opinion, but I like it. 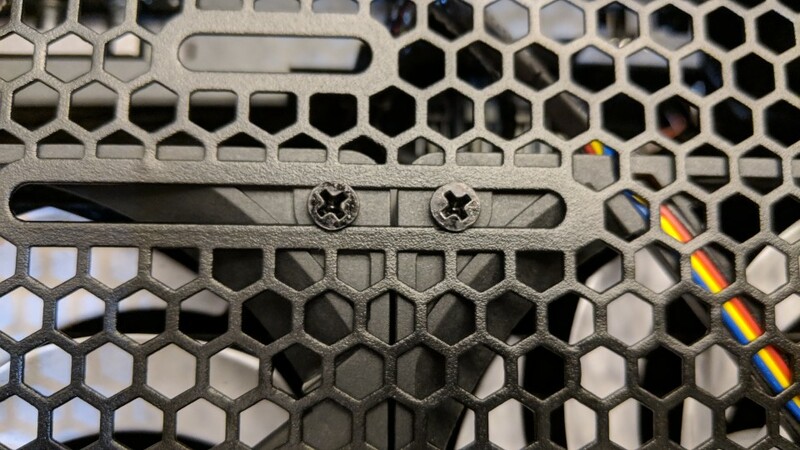 The Meshify C has a great amount of grommets, and the angled motherboard tray edge is normally a great idea. 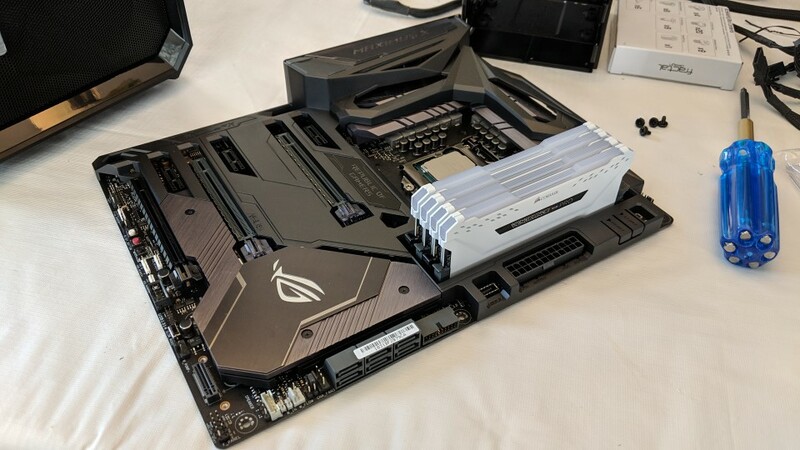 However the Maximus X Code is a large ATX board it seems, leaving little wiggle room at the edge of the board and the angled part of the case. And the placement of the USB 3 header is in exactly the wrong spot for where the two grommets come together. So, no front USB 3 for me for now. A custom cable that has a 90 degree connector might work, if such a thing exists; I haven't checked. Not a big deal because I have a hub I use for most things, but a bit of an unforeseen issue. 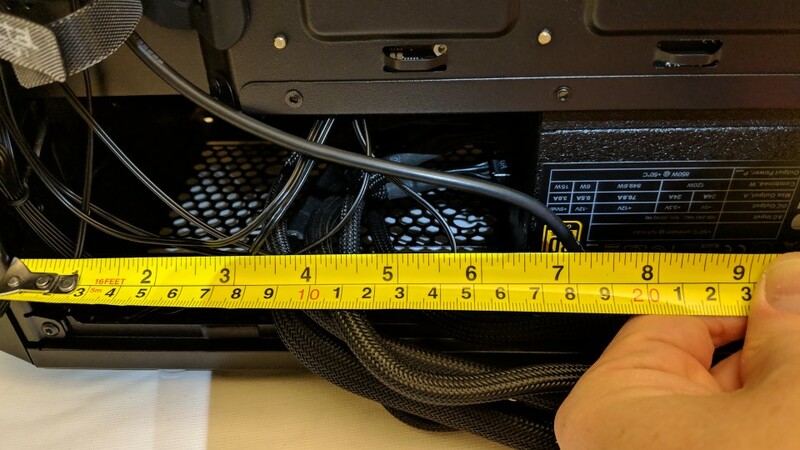 The EVGA is a fairly long power supply, but it did fit. This is just a shot to show the amount of space I have in the bottom chamber. My hope is get a 360 rad in the front for the custom loop, and then figuring out where to put a res and pump. It will take some planning with this power supply. By this point I started to test the fit of the H240-X that I planned to reuse until I get the custom loop parts. This was my mistake. I thought I had read online that 280mm rads would fit in the top, although the manual doesn't recommend it. 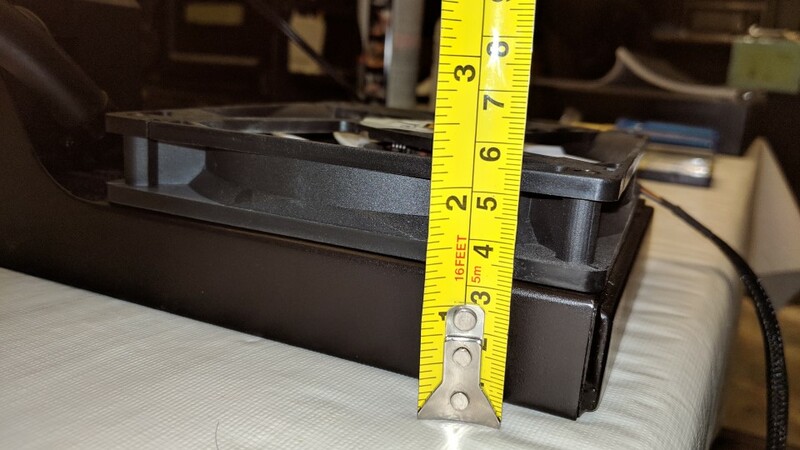 However the top of the case certainly does have mounting holes for 280mm rad it appears. 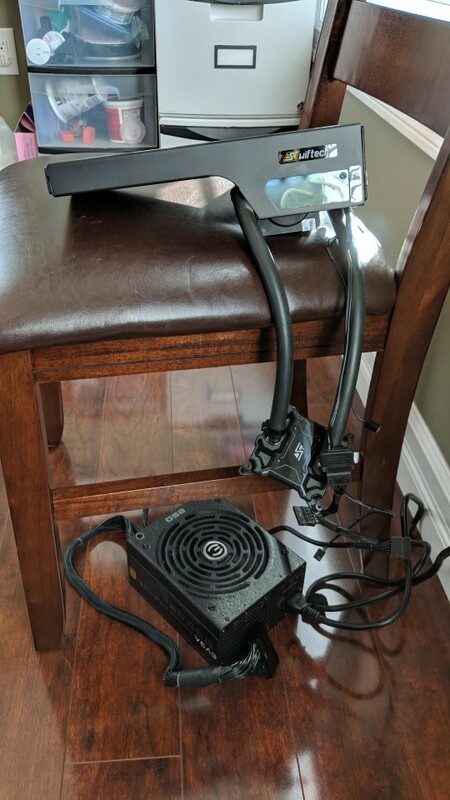 Luckily, I still had my older H220 from Swiftech, a 240mm AIO. So I proceeded with that. Also cleaned and flushed that AIO too. The coolant is EK Cryofuel Clear appropriately mixed with distilled water. 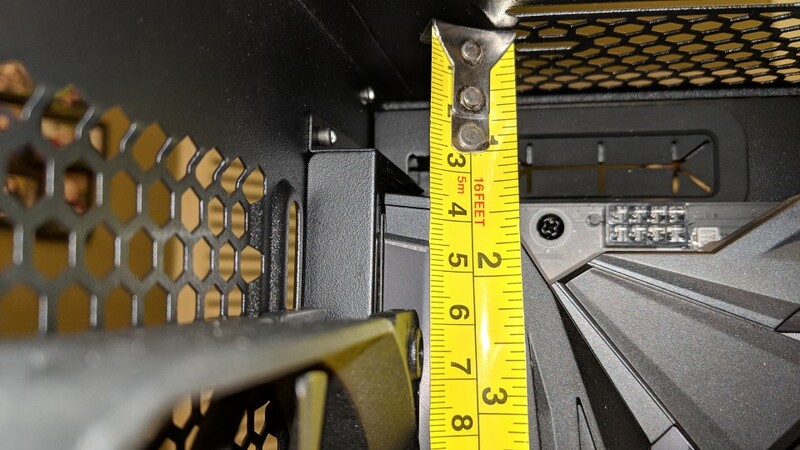 One thing I did notice about the Meshify C is that the metal is very soft especially in the metal grill areas of the case. If I tightened the screws even a little bit too far I could warp the metal out of shape. That surprise me a bit, much less metal than the 650D, but it is only a $99 case (the clear TG version I bought) so maybe that is to be expected. 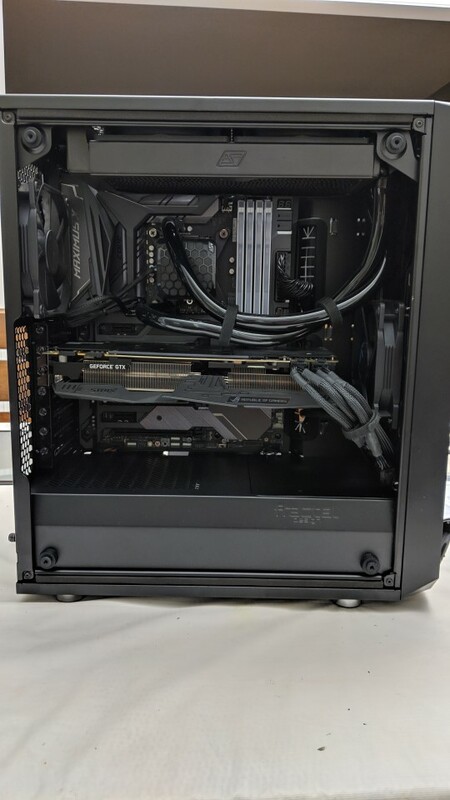 Video card length and front rad and fans is another concern as this moves towards a custom loop. With slim rads and fans I think I'll be able to make it work. And the length of the GPU PCB is 287mm; shorter than with its shroud. It will be tight though. 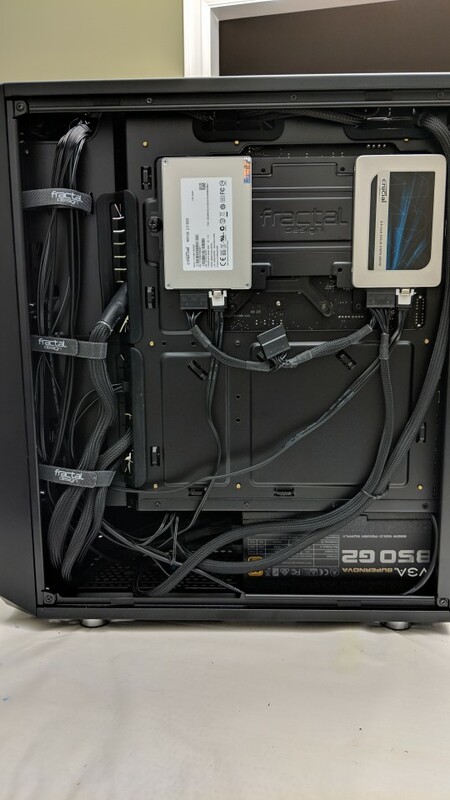 SSD installation and cable management was certainly easy. Everything assembled with the current gear! The GPU cables I may have to replace with custom at some point. The EVGA ones have extra 6-pin iirc that branch to additional GPUs. 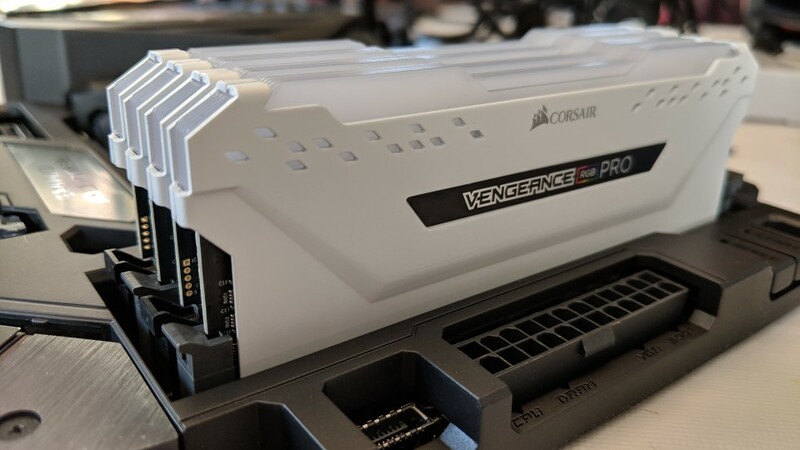 Convenient if you had more GPUs, but bulky if you only have one. I've bundled them as best as I could. 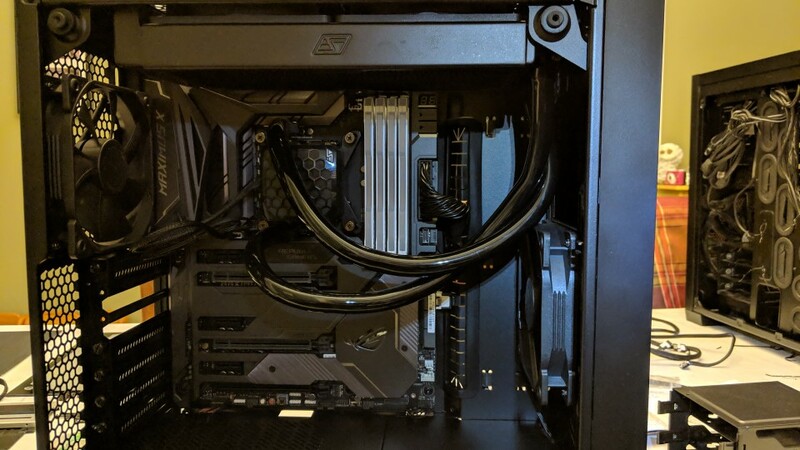 And the AIO tubing is bundled together just because I thought it looked a little more tidy and kept it from resting on the GPU. 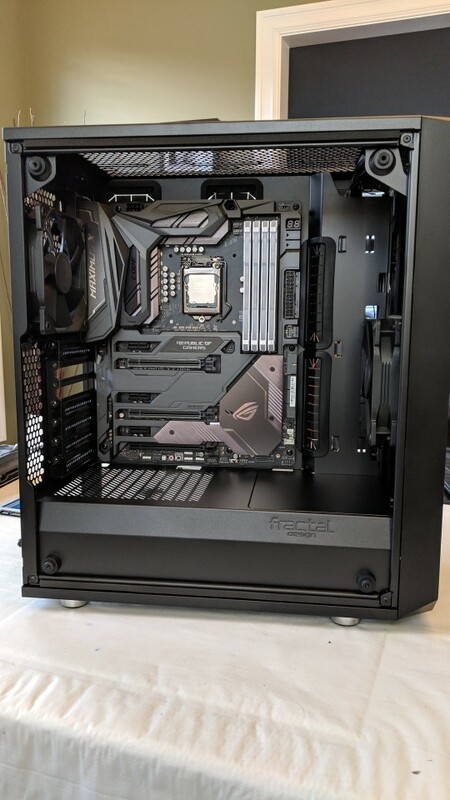 It turned out to be very fortunate that I had the H220, besides the size issue because somewhere in this process I killed the pump in the H240-X. I was very careful when refilling the AIO to run the pump only when it had fluid as I was filling the loop. But towards the end of filling it started to lag coming on. So I would turn on the power supply and a second or two would pass before the pump engaged. Then when I later installed it in the 4790K/650D system going to my daughter, it was completely dead. Nothing I tried could get it running and the CPU expectedly very quickly ramped up its temp just sitting in the BIOS. So I don't know if I did something or if it was just coincidence. Maybe the pump didn't appreciate be power cycled so many times? Nothing I read online indicated that and I don't see why that would be any different than powering on and off your PC as you would hundreds of times. I'll be figuring out what I need for the custom loop, the placement and design I want, and starting to get the parts together. I'll post pics of the parts as they come in and as I continue the process. Probably just an unfortunate coincidence... pumps do die eventually and that water looks grungy so maybe it's been working harder than it should have been the past while. 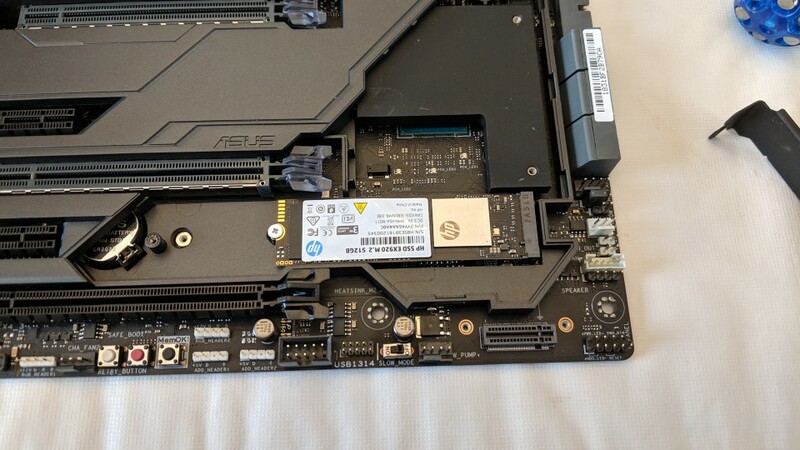 A bit late now, but for your USB3 header, maybe plug it in before you screw down the motherboard? 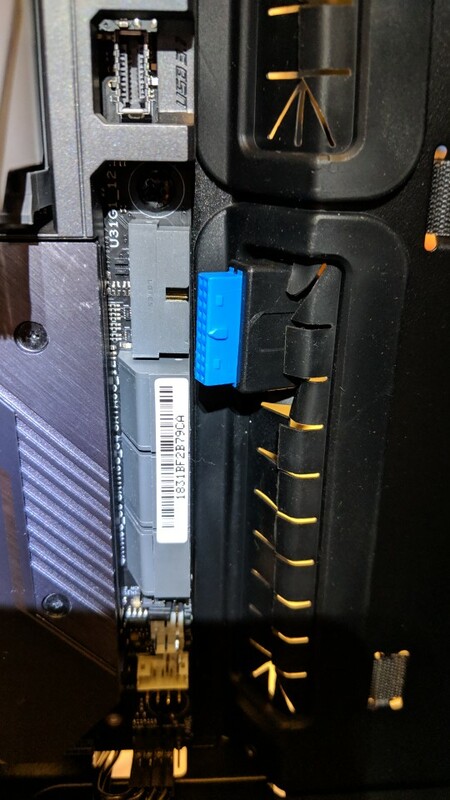 Might be able to wedge it in, but I guess the connector itself is probably a bit too big still. No extra space if you were to remove the top part of the grommet? That is what I found. Where the motherboard ends up and that angled part of the case starts, I don't think there is enough space is the horizontal direction for the header when plugged. Now I didn't try removing the grommet. That might be an option; don't know if that would give it enough horizontal space or not. I will check that when working on the new loop. I don't think you'd see much of it so it might still look OK if it fit. I'm sure you can source it from other places too since most of the stuff on there can be found on AliExpress and such. Not sure if it would be much cheaper though. Thanks JD! You keep doing my work for me ;) Those look like two great solutions. I'll add them to my "parts-needed-for-custom-loop" list! Another source for 90* adapter. I bought these for my latest build. Send me a PM with your address and I'll pop one in the mail. Wow, thanks all! Got links from you before I even had time to search. I should have figured this was a problem already solved many times over.